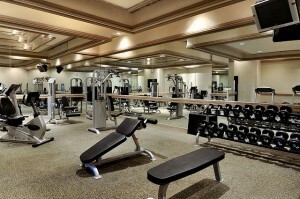 A New York City apartment building has a gym that only certain tenants can use. Which tenants? The newer ones who are paying market-rate rents — and not the ones who’ve lived there long enough to qualify for much cheaper, government-subsidized rent. Some tenants call this “fitness apartheid.” What do economists call it? HAMERMESH: The owner had to spend money creating this gym, right? How is the owner going to get the money back by giving it away for free to people who are already getting an extremely good deal? Essentially what the people who are rent-controlled want is a bigger subsidy than what they’re already getting. Isn’t that pretty greedy? Also in the episode, you’ll hear a discussion of “poor doors” in New York City, and a discussion of whether first-class seating in an airplane is also discriminatory. I'm sorry, but there's a basic flaw in the proponents of the "fitness apartheid" idea. The developer is not saying "you're not good enough". The developer is saying "you're not paying enough". There's a huge difference. If everyone in the building was paying market rate and the developer still singled people out and said they can't use the gym, that would be "fitness apartheid". I agree that the situation isn't ideal for those who can't use the gym, but they're getting the benefit of a rent controlled apartment in Manhattan. Take some of that rent that you're not paying and join a gym. What you're saying would be true *if* the developer was offering government-subsidized tenants use of the fitness facilities for a fee. If that were the case the developer could reasonably charge the difference between the government-subsidized rents and the market rate rents. The problem is that the developer is not offering any options to the government-subsidized tenants, which amounts to discrimination. I was basically going to say exactly what Nathaniel said, so i'll just second you, Nate. Contrary to what Levitt says, a lot of markets do this. Off the top of my head, cable companies will offer a much lower rate to new subscribers and then move them to a higher rate once they've been with them for a year. The only difference is that with the cable company the service is the same but the rates are different. In the apartment example, the rate/services seem to be congruent. I would say the cable companies disrespect their customers way more than this apartment complex. 1) Why wouldn't you call this price discrimination? Is it simply because no actual price is being offered? Either way it is discrimination. 2) Why would you claim that a landlord deciding to restrict access to the fitness facilities without even offering the government-subsidized tenants a charge for access (i.e. discrimination) is an example of why regulation is bad? Would that mean that if the landlord decided to grant access to the government-subsidized tenants it would be an example of why regulation is good? Obviously not. That's a foolish conclusion. I'm really disappointed in your ability to break down the nuances of the situation. Mixed Income Housing is intended to breakup concentrated poverty nationwide, to eliminate the ghettos. Reagan's Low Income Housing Tax Credit Act was supposed to encourage private developers to allow low income individuals stay in their properties, alongside more well off individuals in exchange for a tax break. It's intended as a market based solution to these problems, but ends up being incredibly complicated. A voucher program is probably the better route to go, while enforcing penalties against those who reject a tenant simply because they receive a voucher. I think you missed a huge "hidden side". The people paying full price for their appartments are probably paying more than the apartment would go for if their was no rent control (city-wide). It may not hold in one building since the rents still need to compete with other buildings, but if rent control were abolished in the city, fair-market rents would go down due to more inventory. And if you think that was too tortured, they are certainly paying more in taxes so the city can subsidize the building owner for the rent-controllers. Either way the full-pricers in the building are subsidizing the rent-controllers. Shouldn't THEY feel discriminated against? At no point in the story was it stated that all of the residents paying full rent are wealthy or even that they are wealthier than those with rent control- they are simply residents who could not obtain rent controlled apartments (perhaps because rent control was phased out before their arrival), which are inherently very desirable and therefore difficult to obtain. It is possible that some full rent paying residents enjoy a worse financial situation than those with rent control (e.g. if the difference in earnings is less than the difference in rent). A resident with income of say $110k paying a ~50% tax rate and spending $48k for full priced rent in this building would be financially worse off than another rent controlled resident earning $50k and paying $12k for rent (and also enjoying a lower tax rate thanks to their lower earnings). It is clear that the rent price discrimination creates unfairness, but it is not clear who is most wronged or why it is in the city's interest that they be so wronged. Who the heck decided to give this idiot Saxton a platform. First of all, "rent stabilized" (aka rent control) is an idiotic policy. This isnt apartheid, Saxton's low rent is theft. Understanding the concept of this podcast, I think we should recognize that the market can't always be an excuse for acting terribly. These are not new regulations. The tenants moved into these buildings under certain conditions and assurances and the buyers took on this building knowing that these agreements were in place and they are changing the equation. You can say it is a bad agreement but if you got a good lease on your car you wouldn't be happy to find the dealer installing features for resale that are blocked from your use, though you could always "stop being a freeloading bum" and pay full sticker price for a new car. I am sure it is lucrative to force old tenants out. Consumers have agency too, though, and I think behavior like this should be made less commercially appealing by getting the word out about their actions and making it so that people do not want to deal with this building owner. Did Dubner tell these economists people in rent controlled apartments are willing to pay for the gym? The fact that it isn't addressed in this podcast is really glaring. I think you should sell t-shirts based on great quotes from each episode. Today's: "So you're basically calling me a panhandler"
The basis for apartheid was discrimination for and against protected classes. In the case on the podcast some tenants seemingly turn this concept upside down as the protected class, eg. rent controlled leasees, were trying to make the case that they were not protected enough! This is really about unabashed greed, but not of the developers. These tenants want more and more without paying what everyone else pays. Further they are now corrupting the political process to extract more economic rent (you see what I did there?). Folks used to be grateful for the largesse they received from society. I am sorry this makes folks feel bad, but market-based renters feel bad too when they pay their monthly rent check that is multiples of what they know others are paying for the same space. Something missing from the podcast is a reaction from the market price tenants. I suspect that one of the reasons the landlords aren't putting a price on the gym membership is that many of the market price tenants would say "I don't want the gym so I want a discount of the gym rate." I don't live where there is rent control, but I imagine that part of the purpose behind it is to prevent landlords from forcing residents out by arbitrarily raising rents. Thus, it seems to me, that the landlord's activity of making the rent controlled residents "second class" in an apparent effort to convince them to leave violates at least the spirit of that idea. Easy to start a trend? Germany had a trend which turned into the Holocaust? Did anybody else almost slip on that slippery slope?